This year YuppTV is having a great Black Friday Sale with amazing offers for it's beloved customers in the US region. For YuppTV subscribers and viewers, these sale offers are guaranteed to provide viewers the channels they need at reasonable prices for new and continuing customers. The Black Friday sale offers allow customers to obtain great discounts on subscription and box packages. YuppTV viewers should know the Black Friday Sale on the YuppTV Hindi Gold and Hindi Platinum Packages allows customers get to save up to 50% off on their subscription costs. For this limited sale only viewers have access to upgrade their subscriptions as,YuppTV Hindi Gold subscriptions drop to amazing discount costs of $9.99 monthly, $29.99 half-yearly and $119.99 yearly, while YuppTV Hindi Platinum subscription discounted costs amount to $24.99 monthly, $139.99 half yearly and $239.99 for the yearly subscription. With these amazing packages in tow, one can easily upgrade their subscriptions within the same package either from monthly to half-yearly or to yearly. They are also able to save and upgrade from YuppTV Hindi Gold to Platinum at the previous cost of the Hindi Gold package, and access more popular Indian TV channels such as Zee Cinema. It gets better; the sale extends to box packages whereby, the Yupp Hindi Gold Plus Pack is offered at $169.99 yearly allowing one to save over 50% from the previous cost of $289.99 and Yupp Hindi Platinum Plus Pack is offered at $249.99 yearly from the previous cost of $349.87 allowing one to save over 50%. These offers can be easily accessed and paid online on the YuppTV website for customers in the US region. YuppTV members can easily subscribe by logging into their account's, select the subscription they would like and enjoy their favorite Indian TV Channels. Those new to YuppTV can easily create a YuppTV account instantly and purchase their subscriptions. 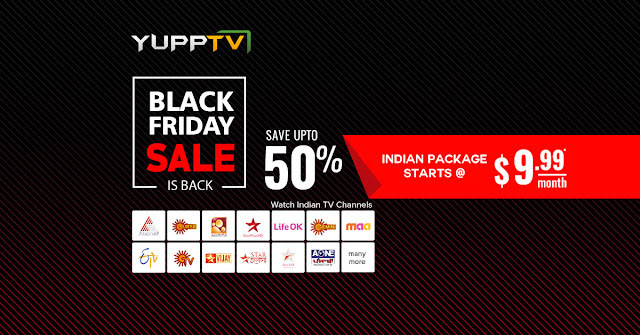 It is completely hassle-free to access and enjoy YuppTV's Black Friday Sale offers.